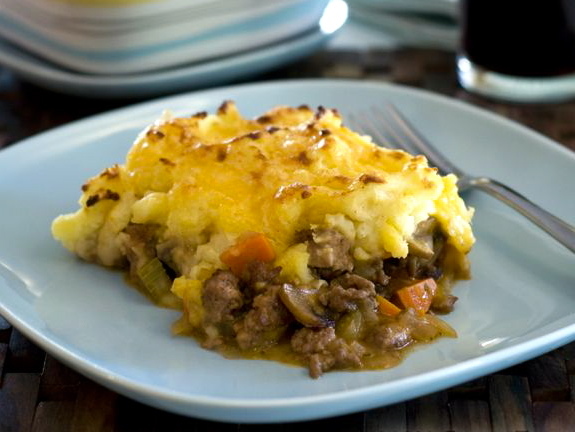 This easy recipe is just the thing for blustery winter weather when a casserole and a pint of Guinness stout is in order. Everything is better when it is topped with homemade mashed potatoes and Cheddar cheese, but if you don’t have time to make your own, you can use good-quality boxed mashed potatoes to top the stew instead. You will need two 4-ounce packages. Put the potatoes in a 4-quart saucepan; add 2 teaspoons of the salt and cold water to cover by 2 inches. Bring to a boil and cook until the potatoes are tender when pierced with a fork, about 20 minutes. Drain; return to the saucepan and mash with a potato masher until almost smooth. Add the milk, butter, nutmeg, and cayenne, and mash until completely smooth. Season with the salt and pepper to taste and set aside. Heat the oil in a large sauté pan over medium heat. Add the onions, carrots, celery, and mushrooms; sauté, stirring occasionally, until the onions are translucent and the vegetables are tender, 10 minutes. Add the flour, stir until it has been absorbed, and cook for 1 minute. Add the tomato paste, thyme, sherry, and stock; bring to a simmer over medium-high heat. Adjust the heat to maintain a gentle simmer and cook until the stew is thick and bubbly, 15 minutes. For vegetarians, put the soy crumbles in a 1½ cup baking dish, stir in ⅔ cup of the vegetable stew, spoon mashed potatoes on top in a 1-inch-thick layer, and set aside. Pour the remaining stew into a 2-quart baking dish. Wipe out the sauté pan and return it to medium heat. Add the lamb or beef and cook, stirring to break it up, until it is browned and cooked through. Drain the fat and stir the meat into the larger baking dish. Top with the remaining mashed potatoes. Sprinkle the cheese over both dishes, place them on a baking sheet on the center rack of the oven, and bake until the stew is bubbly, about 15 minutes. Turn on the broiler and broil until the cheese is bubbly and browned in places, about 2 minutes. Cool at room temperature for 10 minutes before serving; the pies will be atomic-hot.